The Minnesota Court of Appeals ruled today that churches in the state have the right to ban handguns, despite the so-called concealed carry rule which allows residents to carry firearms. Here’s the full decision (pdf). 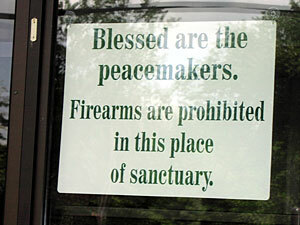 An Edina church got this issue started when it sued over the part of the law that required churches and other private property owners to specifically post signs banning the guns. The enumeration of rights in this constitution shall not deny or impair others retained by an inherent in the people. The right of every man to worship God according to the dictates of his own conscience shall never be infringed … nor shall any control of or interference with the rights of conscience be permitted, or any preference be given by law to any religious establishment or mode of worship; but the liberty of conscience hereby secured shall not be so construed as to excuse acts of licentiousness or justify practices inconsistent with the peace or safety of the state. Tangent time – In Glens Falls, New York, a newspaper has upset gun clubs and gun owners after submitting a Freedom of Information Act request for the names of gun permit holders in the community. Your link to the case is wrong.